For an N-Channel MOSFET, current is switched from drain to source. But a P-Channel MOSFET works in the opposite way - in a P-channel MOSFET, current is switched from source to drain. See this appnote from IRF. Also, the anode of the integral body diode in a power MOSFET is connected to the source of an N-Channel, but the drain of a P-Channel. See this excerpt. Basically, when you have a positive voltage connected to a load, and you want to switch it on and off, use an N-Channel MOSFET between the negative terminal and ground. Allow current to flow by applying a positive voltage that will saturate the transistor (10-12 for power MOSFETs, 3-5V for logic level). Turn it off by pulling the gate down to the source. When you have a load with the negative terminal grounded (which is usually preferable; don't muck with ground if at all possible! ), and want to apply or remove a positive voltage, use a P-channel MOSFET. Pull its gate up to the source (which is connected to V+) to turn it off, or pull it to ground (through an open collector output if your logic signal is less than V+) to turn it on (So that Vg is 0, and Vs is, say, 12V, therefore Vgs is -12V). 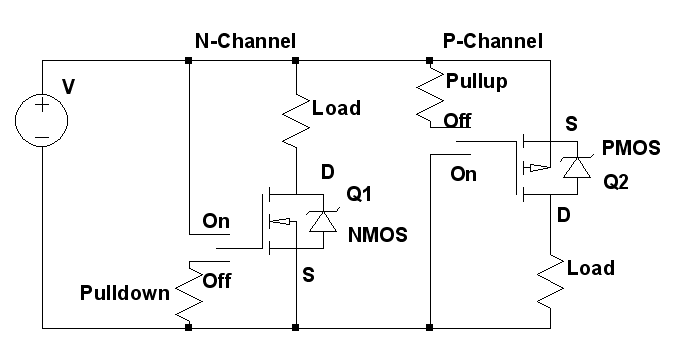 Depletion mode mosfets are less common, and usually only available in N-Channel. For N-Channel depletion mode, the gate must be pulled below the source (which is often ground). Stick with enhancement mode for most switching applications unless you need something strange. To identify the source and drain, look at the side which the arrow is connected to. This is the source. If you've got a physical component, a diode test on a meter is useful both for finding the switched current direction (Apply positive voltage to the terminal which the diode test identifies as negative) and for a basic test (not a guarantee) that the transistor isn't burned up. To differentiate between N-Channel and P-Channel, look at the symbol: N-Channel pointing iN. MOSFET off state at certain voltage? Using a single power source for both the gate and source of my transistor?